On the first day of the International Wine Tourism Conference, held in Perugia, Umbria, Italy, I gave a presentation titled – A Sense of Place: How to leverage your region and place to enhance the customer experience. Among the many topics discussed in my presentation was the importance of telling your story in order to attract clients and generate revenue for your business. I emphasize this to make sure that any winery focus on sharing what makes their story unique, in addition to showcasing their wines, in order to stand out in a competitive market. Terre Margaritelli Winery was an excellent example of a company who knows their story and does a good job sharing it, creating memorable experiences for their guests. A second, very simple, example that I recently experienced was Barberani Winery located in Orvieto, Umbria, Italy. Located just a few kilometers from Orvieto, on the hills overlooking Lake Corbara, Barberani Winery has been producing wines for over 50 years. Founded in 1961 by their grandfather, the winery is now run by brothers Bernardo and Niccolò Barbarani, and is a true family run business. From vineyard work, winemaking, tasting room and marketing, the family is a part of it all. And I know this because they made it a point to share it with me when I visited the winery this past January. We visited on a very cold and windy morning so the vineyard tour, led by Bernardo, went by quickly. In just a few minutes I listened to Bernardo explain the history of the winery; how it has been in his family since its inception, how they are one of the last wine producers in Umbria using only hands in the vineyards (no machines), how they are biodynamic (though not “certified” biodynamic due to the complicated process of certification), how they are known in the region for producing great values, and most importantly – “as a family we do everything here”. In a few short minutes I already understand what they are about – value, sustainability, and family. Now it was time to see if the wines lived up to my growing expectations. 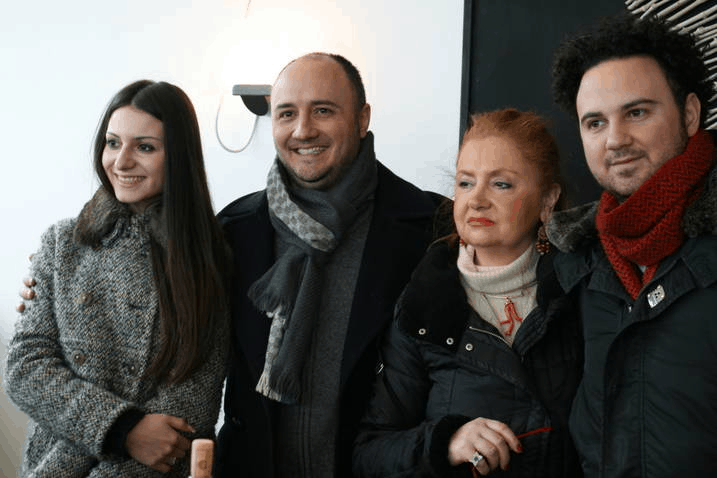 As we sat down for the tasting we were also reminded of the ongoing theme of Italian wines – in Italy wine is food, and each wine we tried was paired with either a thin slice of salty Italian ham or a delectable cheese, served to us by Bernardo and Niccolò’s mother. 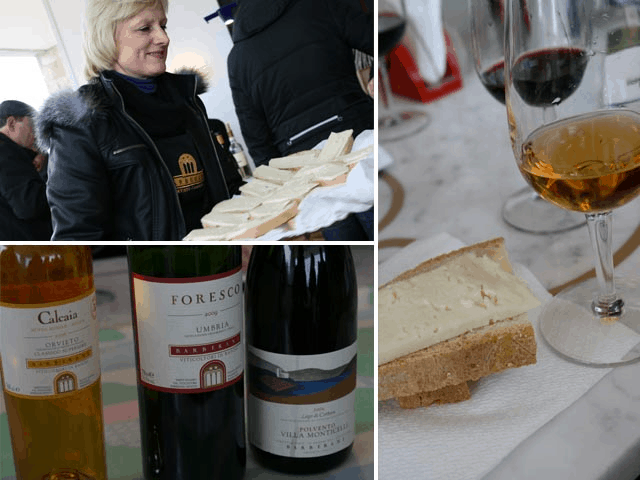 They encouraged us to taste the wines alone, and then try them with food to experience how the food enhances the wine, and vice versa. They were a solid lineup of great wines at equally great prices presented in a well thought out, yet simple fashion. And they most certainly lived up to my expectations. Closing up the tasting Bernardo reminded us that everything they do there was a family venture. His mother preps the food and his girlfriend helps out at the winery as well. You could sense that they are a close-knit family. Before leaving I made a point to ask Bernardo if they do the wine and food pairing for customers, and he told us plainly – “Yes. Today was nothing special. Everything we did here today, from the tour to the sit down food and wine pairing, we do for all of our guests” (for groups of 10+ for approx 22 euro per person). 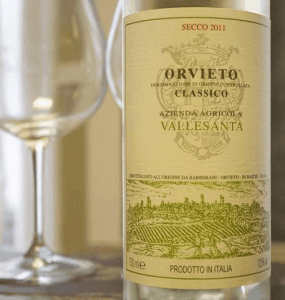 Definitely worth checking out if you should find yourself in Orvieto. Many producers make good wine. That’s not always enough to stand out these days with so much competition. It seems so simple – to share your story with your guests – but you might be surprised by how many wineries I visit that don’t share anything about their story. It is about a customer experiencing more than just your wines, it’s about them also experiencing your story. It is then that you create the memory that customers keep for a lifetime. And for you that may also mean creating a lifetime customer. 2006 Polvento Villa Monticelli, Lago di Corbara DOC “Rosso” (a blend of primarily Sangiovese with some Cabernet Sauvignon and Merlot). Lago di Corbara (Lake Corbara) is the name of lake visible from the winery and has its own small DOC. Bold, rich fruit, and pronounced tannins this wine is textured and well structured. Served alongside a piece of salty and fatty Capicola helped to soften its bold tannins. Villa Monticelli is considered their “premium” wine label (they have three different labels), but with a price tag of 18 euro, I considered it a bargain and bought a bottle to take home. 2006 “Calcaia” Orvieto Classico DOC Superiore Muffa Nobile. This was a sweet desert wine made by grapes affected by botrytis cinerea or “noble rot”; a non-harmful fungus that develops on grapes, causing them to shrivel, concentrating the sugar levels and intensifying the flavor. We were told that Orvieto is the only region in Italy that can put the name “Muffa Nobile” (Noble Rot) on their labels. It had a beautiful honey sweet nose and rich body with mouthwatering apricot, lychee, and candy apple fruit, and paired surprisingly well with a thick slice of asiago cheese. Though I did not taste this wine at the actual winery that day, I did find it at my local wine store. I originally bought it for its great price, it wasn’t until I got home that I realized Barberani produced the “Vallesanta”, which is considered their “value” label. A white wine produced from the traditional trebbiano, verdello, grechetto, malvasia, and drupeggio grapes. Bright, fresh and acidic with lemon, lemon peel, pear, apple and pineapple. Fresh and zippy on the mouth with a slightly minerally finish. This wine has a lot going on for ten bucks! It is a solid buy and is good with everything from fish tacos, salads, light appetizers, and sipping on the porch while watching your dogs nap in the grass on a sunny afternoon. I will continue to buy this super value as a staple in my house this summer as long as my wine shop continues to carry it. Wow! And that is a great story that makes me want to run out and find that wine locally!